Today I’ll share a recipe for one of my favorite Turkish dishes. It is a fine cracked wheat (a.k.a bulgur or burghul) salad. In Turkish the salad is called kısır. This is a very nice thing to eat on hot days, along with a nice lettuce, cucumber, and yogurt sauce. One item commonly used in this salad that is not readily available in most US markets, is red pepper paste. 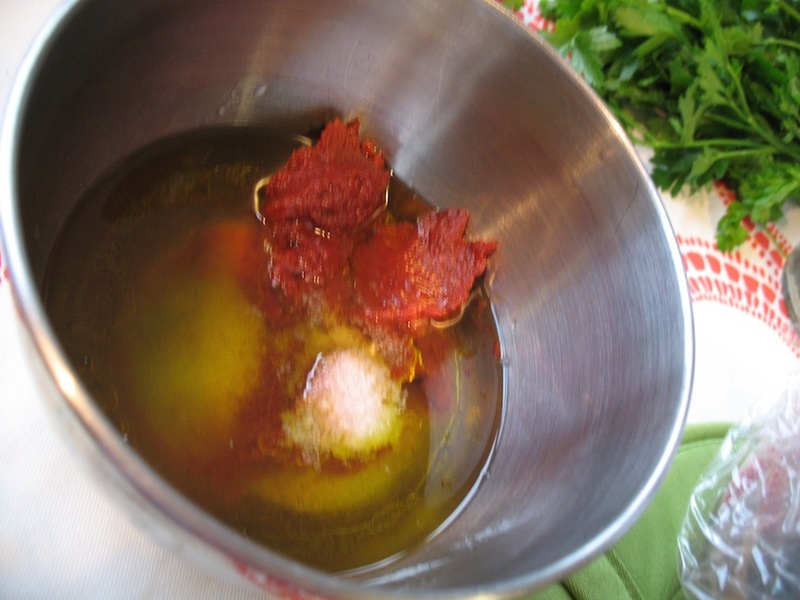 This is similar to tomato paste, but made from peppers, of a variety akin to Hungarian paprika. 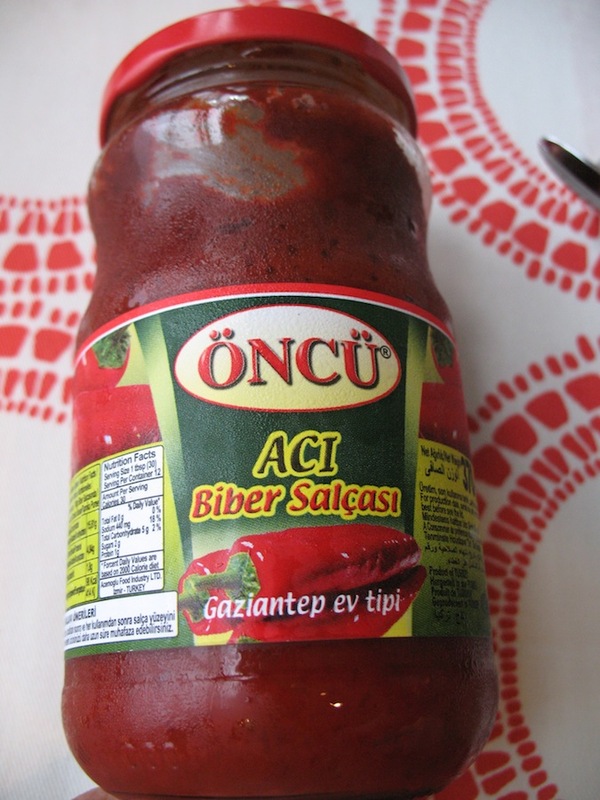 The Turkish name is biber salçası “pepper paste”. Here is the brand that I am using, found at one of the comprehensive Turkish markets in Delran, NJ (if you are serious about cooking Turkish food, you need to visit the communities near Delran). This one is a acı “hot” version of the paste, I don’t find it particularly spicy, but the regular kind would be less spicy. So far I’ve only found one market that has Turkish pepper paste in Philly. That is the Queen Village market on 2nd street (see map section), which carries many desired Turkish food items. The bag of bulgur below was also purchased there. 1 cup bulgur (cracked wheat, also known in Arabic as burghul). 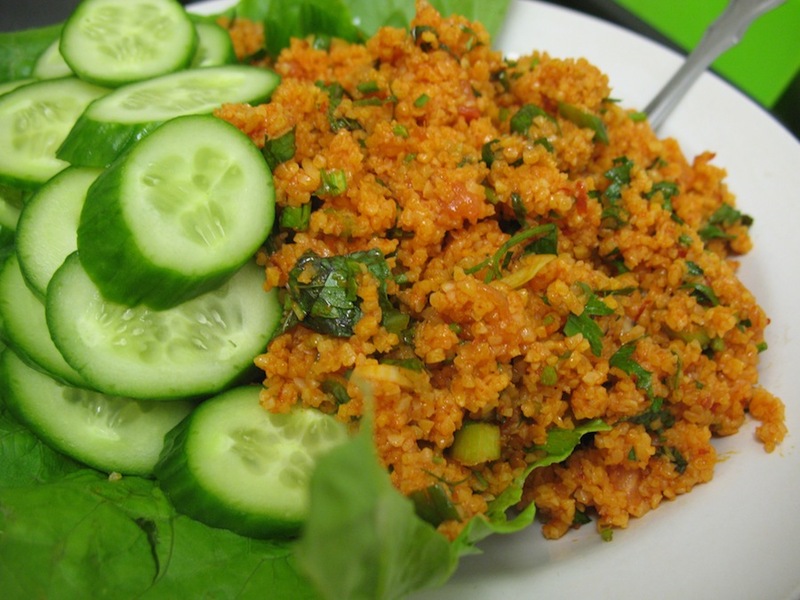 For this recipe it is best to use fine or medium fine sized bulgur. Most markets sell a variety of sizes. Some brands are numbered 1-3, fine to coarse. My bag says “fine” on it. One cup goes a long way. This recipe will feed 2 or 3 easy. 1. Boil water in a kettle. 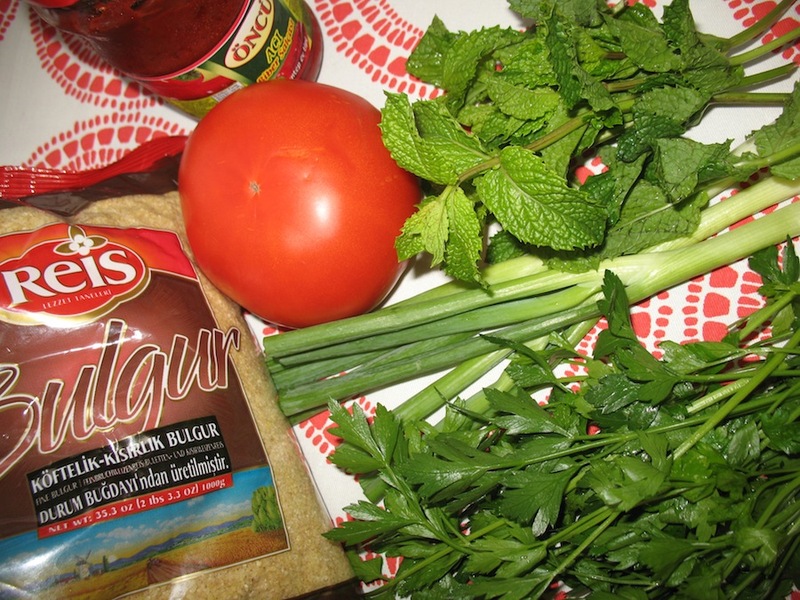 Put the bulgur in a bowl (with room to grow–i.e. with high sides). Pour the boiling water over the bulgur, just covering it. 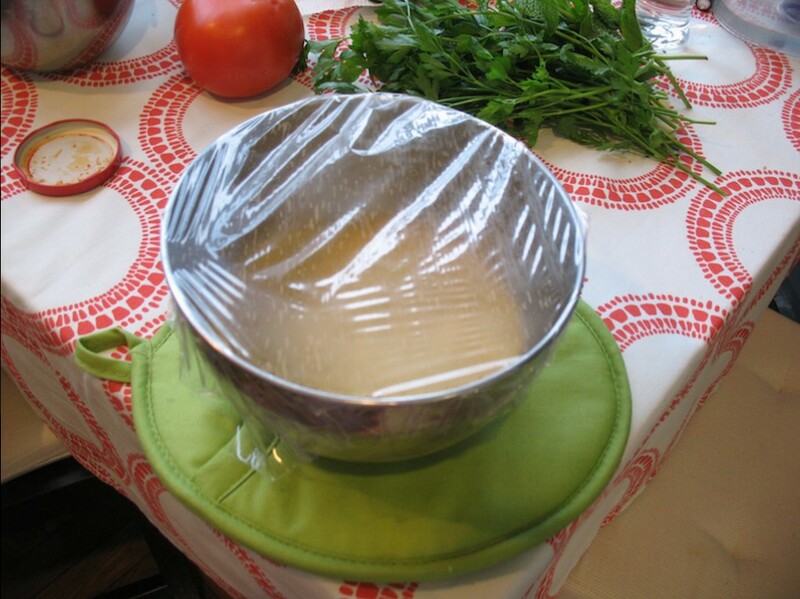 Cover the bowl tightly with a plastic wrap, lid, or some mechanism. Let sit until bulgur swells, about 10 minutes. Do other steps meanwhile. 2. 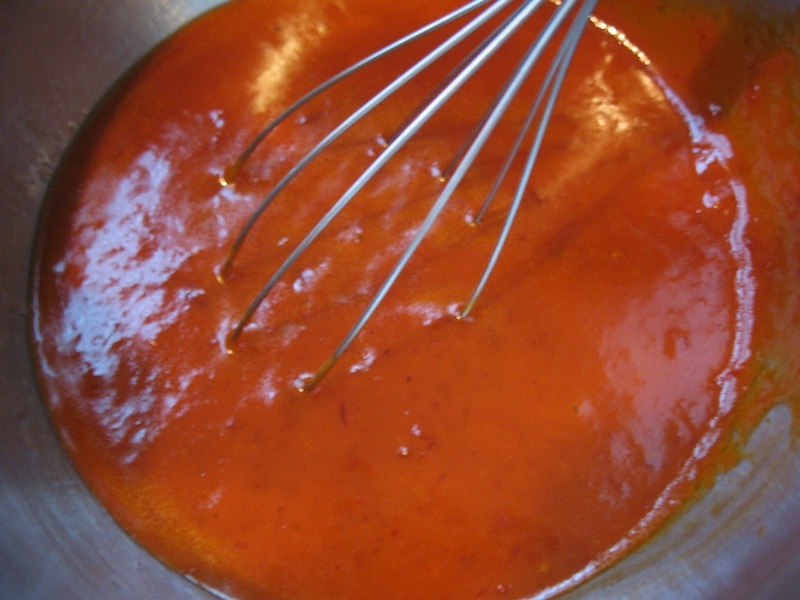 Put the oil, vinegar, pepper paste, and salt in a bowl and whisk it to a thick sauce. Pre-mixing in this way makes it easier to distribute the flavors among the bulgur. I suggest not using all of this mix, but mixing with the bulgur salad to taste. 3. chop the herbs, green onion, and tomato. If the tomato is really watery you might want to drain or squeeze out some excess water with paper towels as bulgur might get too saturated. *This is a standard recipe (i.e. derived from other recipes) that I’ve used and enjoyed many times. Today it seemed a bit too much vinegar and pepper paste. So, maybe less is needed. Best to taste as you go. This entry was posted in - Featured Food Discoveries, - Recipes, Turkish food and tagged biber salçası, bulgur salad, cracked wheat, kısır, pepper paste, Turkish Markets. Bookmark the permalink.